Frank Elmer Coe was born to Nelson and Caroline (née Workman) Coe on 1 February 1872. Raised in Torrington, Frank Coe attended public schools in town, and received some higher education in Nebraska. After two semesters at Doane College, Frank Coe returned to Torrington to manage his father’s business. The Coe Furniture Company, founded by Frank Coe’s grandfather, specialized in home goods. Under Frank Coe’s administration, the corporation branched out into retail, including bicycle sales and repair. Frank Coe married Jennie A. Ford on 3 April 1895; they had one son together, Franklin Earl Coe, in May of 1897. In 1899, Frank Coe sold the furniture company, and the following year he got a job at the Warrenton Woolen Mill. The mill was managed by two of Coe’s uncles and specialized in manufacturing kersey cloth, mostly for police, postal, and navy uniforms. Starting as a wool grader, Coe worked his way up through the organization. By the time the new Main Street factory opened in 1908, he was an officer of the corporation. When the company recapitalized in 1911 and over the next decade, he purchased additional shares, eventually gaining control of the mill as he rose from secretary, to treasurer and, ultimately, to president. Frank Coe took an interest in community affairs; he was a member of the Rotary Club, the town board of relief, President of the Torrington Wheel Club, and Exalted Ruler of the Elks. Until 1923 Torrington had two governments, a town government that serviced the rural areas, and a borough government that maintained services in the built up areas around the factories. Coe served the borough as a burgess (selectman) during the 1910s; in 1917 he was elected Warden, a position similar to that of mayor. Coe served on both the Democratic Town Committee and the party’s state committee; he was considered for the 1920 Gubernatorial nomination, but declined. 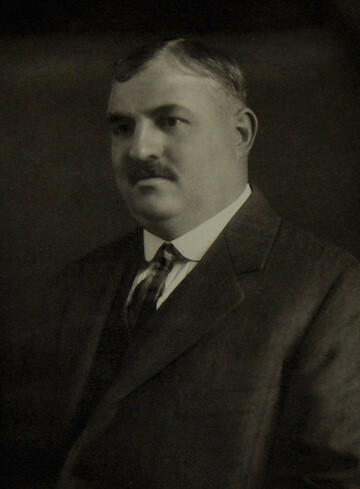 In 1923, he lost in Torrington’s first citywide mayoral election. In the early 1920s, Frank Coe joined the executive board of the new Torrington Boy Scout Council, and in April of 1923, the members elected Coe Council President. As president, Coe worked to establish a council camping program, but he put his efforts on hold when the Council Executive resigned. Frank Coe searched throughout New England for a trained, experienced professional and recruited Earl C. Beebe from the Greater Providence Council. With a camp man on board, Coe searched for a location in the hills around Torrington. On 24 May 1924, Coe purchased land fronting West Hill Pond in New Hartford. He named the property after his recently deceased mother; by inserting his father’s name between the two syllables of his mother’s name, he created the unique word Workcoeman. A mere four days later, Frank Coe died of heart failure. At the memorial service, Council Executive Beebe served as one of the pallbearers. Members of the civic clubs Coe was active in attended, along with mill employees and the city’s police and fire departments. At the burial, a Boy Scout honor guard escorted the body to the grave.